Unmid Snow-Shod is a Nord warrior who lives in Mistveil Keep as the housecarl of Jarl Laila Law-Giver. He is the son of Nura Snow-Shod, a Talos priest, and brother to Asgeir and the son of Vulwulf. He is also the boyfriend of Anuriel, the jarl's steward. If the Empire regains control of the Rift, Unmid will be exiled to the Palace of the Kings in Windhelm. He wears elven armor with elven boots and gauntlets. He wields a steel greatsword in combat. When approached, he can be found saying, "As Jarl Laila's housecarl, I would ask that you maintain a respectable distance from her at all times. ", "I'd request that when speaking to Jarl Laila, you show the proper respect. ", or "Did you have some sort of official business here?" If you ask him if he protects the Jarl, he will confirm and explain the threats to Jarl Laila: "Indeed. There have been multiple attempts on the Jarl's life. We're not certain if it's the Dark Brotherhood or simply Imperial sympathizers. We've also had run-ins with spies attempting to probe our security for weaknesses. I work with the city guard to make certain they fail. At the end of the day, I'm the last line of defense for the Jarl. I will not allow her to fall." Asking about his thoughts on the war will reveal that he is a staunch supporter of the Stormcloaks, as he will tell you, "Ulfric's a bloody hero. I don't think there's a worthy Nord alive who'd dare argue the point. He's taking the Empire to task and making them answer for their crimes. I don't think I'll be content until Ulfric sits upon the throne of Skyrim with the ashes of the Concordat at his feet." 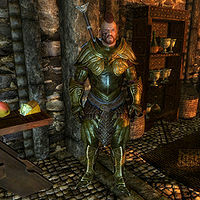 He has a low opinion of the Thieves Guild and will express such upon inquiring him about the guild: "Liars and bastards. Every one of them. I'd have their heads on a pike if it wasn't for the war effort. All I need is a dozen men and we could march into the Ratway and burn them out like rodents. Stormcloaks won't have it though. Too busy keeping the Imperial forces at bay." You may further ask him about the Ratway, which will yield: "Everyone knows the Thieves Guild uses the old sewer system beneath Riften as their hideout. I'd go down there myself, but that would leave Jarl Laila unprotected." In exile, he will comment on his current state: "Being in exile is the most humiliating thing I've experienced in my life." and tell his experience: "I killed scores of the Empire's men before I was forced to surrender." He will explain why he surrendered: "The only reason I stopped fighting was a plea from Laila, otherwise I'd would have fought to the death." and end with, "I'm keeping my eye on you." Esta página foi modificada pela última vez à(s) 09h52min de 6 de novembro de 2014.